For other uses, see Central Florida (disambiguation). Central Florida is a region of the Southern U.S. state of Florida. Different sources give different definitions for the region, but as its name implies it is usually said to comprise the central part of the state, including the Orlando area. It is one of Florida's three directional regions, along with North Florida and South Florida. It includes the following counties: Brevard, Citrus, Hardee, Hernando, Hillsborough, Indian River, Lake, Manatee, Marion, Orange, Osceola, Pasco, Pinellas, Polk, Seminole, Sumter, and Volusia. Like many vernacular regions, Central Florida's boundaries are not official or consistent, and are defined differently by different sources. A 2007 study of Florida's regions by geographers Ary Lamme and Raymond K. Oldakowski found that Floridians surveyed identified Central Florida as comprising a large swath of peninsular Florida. This area encompassed the interior, including the Orlando metropolitan area, and coastal stretches from the Big Bend south to the Tampa Bay Area in the west and from Daytona Beach south to Martin County in the east. In addition, North Central Florida has emerged as a vernacular region representing the interior area in the northern part of the state. Central Florida is one of Florida's three most common directional regions, the others being North Florida and South Florida. Lamme and Oldakowski note that the directional region is more commonly used in the interior areas rather than on the coast. In fact, while coastal areas often have their own regional vernacular identities such as the Space Coast and the Nature Coast, no vernacular regions were reported on the interior of the state other than Central Florida. Enterprise Florida, the state's economic development agency, identifies "Central Florida" as one of eight economic regions used by the agency and other state and outside entities, including the Florida Department of Transportation. This definition covers much of the same area as in Lamme and Oldakowski's survey, with some exceptions. It excludes the Tampa Bay Area and North Central Florida, as well as the southern coastal counties (the Treasure Coast, which is included in "Southeast" or "South Florida"). The Central region includes the Orlando metropolitan area (Orange, Lake, Osceola, and Seminole Counties), Marion and Sumter Counties in the interior, and Volusia and Brevard Counties on the coast. The central cities of both metropolitan areas (Orlando and Tampa) are in close proximity (85 miles (137 km)), and as a result, their two metropolitan areas blend together in the area of Lakeland to make up a larger contiguous population center often referred to as the I-4 corridor. This is a population concentration that stretches from Tampa Bay on the west coast to Daytona Beach and Cape Canaveral on the east coast of the state. With the exception of hill terrain in southern Lake County, Hernando County, Pasco County and Polk County, Central Florida is mostly flatland with significant amounts of open space and over 1,500 lakes and ponds. There is a mixture of wetlands, Cypress, Oak, Maple and Pine forests, pastures, prairies and coastline. Major rivers include the St. Johns River, the Ocklawaha River, the Halifax River, and the Econlockhatchee River. Major lakes include Lake Apopka, Lake Tohopekaliga, East Lake Tohopekaliga, Lake Louisa, Lake Monroe, Lake Jessup, and the Butler Chain of Lakes. There are over 100 miles (160 km) of coastline in Central Florida along the Atlantic Coast. Major beaches include Canaveral National Seashore, New Smyrna Beach, Daytona Beach, Cocoa Beach, and Indialantic Beach near Melbourne. Hurricanes are a threat to the coastal cities as evident by the 2004 hurricane season, which brought three major hurricanes to the Central Florida area: Charley, Jeanne, and Frances. Historic Cypress Gardens, (Now Lego-Land) in Central Florida. Winters are dry and temperate with the average winter high temperature in Orlando being 72 °F (22 °C). Summers are hot and humid with high temperatures averaging 92 °F (33 °C). Peak summer heat generally arrives in early June and continues to early October. The combination of high temperatures, high humidity, and opposing sea breezes from both the Gulf and Atlantic coasts, results in significant thunderstorm activity from June to September for the interior counties. Central Florida records more lightning strikes per area than any other region in Florida, and Florida records more lightning strikes than any other state in the USA. As a result, Florida, and more specifically, Central Florida, is often referred to as the "Thunderstorm capital of the USA", or "Lightning Alley". These severe thunderstorms often make Central Florida prone to many tornadoes. However, they are usually small, short lived, and almost always rated as EF0 or EF1 size storms. The Yearling, won Floridian Marjorie Kinnan Rawlings a Pulitzer Prize for her glimpse at life in Central Florida. At the end of the Civil War most of Central Florida was barely-inhabitable wetlands. It took a major drainage project financed by Philadelphia businessman Hamilton Disston in the 1880s to make the land available for settlement. Sanford was incorporated in 1877 as port city at the intersection of Lake Monroe and the St. Johns River. It was envisioned as a transportation center, the city's founder, Henry S. Sanford, nicknamed it "the Gate City of South Florida". It became a hub for shipping agricultural products, which earned the city another nickname, "Celery City". Kissimmee boomed in the 1880s. It was the headquarters of Hamilton Disston's drainage company, The city was an important regional steamship port, owing that status to its location on Lake Tohopekaliga. The expansion of the railroads into Central Florida eliminated the need for Kissimmee's steamship industry. The Great Freeze of 1894-95 ruined citrus crops which had a detrimental ripple effect on the economy. The hard-packed sand of Volusia County's beaches lent itself to auto races beginning in 1903, before paved roads were common, leading to the area's reputation for cars and racing. Ormond Beach was a popular spot for those who liked fast cars after the turn of the 20th century because the hard-packed beach was ideal for going fast. That same beach had led to the development of a tourist resort by Henry Flagler. It later attracted Flagler's former business partner John D. Rockefeller, who had a winter home in Ormond. Historic Gamble Plantation, Manatee County, Fla.
During and after World War II, the U.S. Army Air Forces (U.S. Air Force after 1947) and the U.S. Navy established several training facilities and operational bases in the region, mainly aviation activities, later followed by space exploration sites. In the late 1940s, the US military established a missile testing facility on Merritt Island near Cape Canaveral because the land was largely undeveloped and the agreeable climate allowed for year-round operations. When NASA later searched for a long-term base in the 1960s from which to launch spacecraft, they chose the adjacent Merritt Island site next to Cape Canaveral for its access to the testing facility and to nearby communities. NASA purchased over 100,000 acres (400 km2) of land for the Kennedy Space Center. Deltona was developed in 1962 as a planned retirement community. It is now the largest city in Volusia County. Yulee Sugar Mill, located in the Central Florida town of Homosassa. 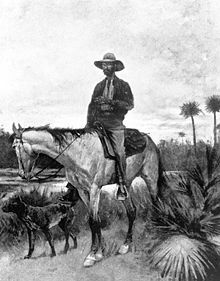 The Florida State Park is the site of David Levy Yulee's 5,100-acre sugar plantation. The mill operated from 1851 to 1864 and served as a supplier of sugar products for Southern troops during the Civil War. Spanish Moss, by Winslow Homer - Tampa bay, Florida. Painting of Spanish Moss swaying from live oak limbs, a familiar scene in Central Florida. The construction of the Walt Disney World Resort was a transforming event for greater Orlando. Walt Disney wanted a location with abundant available land that was more accessible for the residents of the eastern United States to visit. Not only was there ample land in Central Florida, but it was inexpensive and the inland location offered some protection from hurricanes. Plans were announced in 1965, and the theme park opened to the public in 1971. Lamme and Oldakowski's survey identifies several demographic, political, and cultural elements that characterize Central Florida and distinguish it from other areas of the state. While people from all parts of the state associated their area as part of the South, people in the southern part of Central Florida did not typically identify their area as part of "Dixie", while people in northern Central Florida did. People from Central Florida usually did not consider their region part of the Bible Belt. Jackson Rooming House in Tampa, accommodated African-Americans during the era of racial segregation in Central Florida. The hotel played host to prominent figures such as Count Basie, Cab Calloway, James Brown, Ella Fitzgerald, and Ray Charles. Politically, while North Florida overwhelmingly was considered conservative and South Florida was considered more liberal, the majority of Central Florida residents (52%) considered their area moderate; 41% considered it conservative, and 7% liberal. Lamme and Oldakowski's survey tracks with Barney Warf and Cynthia Waddell's studies of Florida's political geography during the 2000 Presidential election. Central Florida's economy is very similar to that in South Florida. Compared to the more diversified North Florida economy, tourism is by far the most significant industry in Central and South Florida, along with a much smaller but significant agricultural industry. Lamme and Oldakowski's survey also found some cultural indicators that characterize Central Florida. In general, Central Florida was similar to North Florida and differed from South Florida in these measures. In Central and North Florida, American cuisine was the most popular food, in contrast to South Florida where ethnic foods were equally popular. Additionally, while there was little geographical variation for most styles of music, there was regional variation for both country and Latin music. Country was popular in Central and North Florida, and less so in South Florida, while Latin was less popular in Central and North Florida, and more so in South Florida. In 2009, the estimated total population of the Central Florida, including the populations of Orange, Seminole, Osceola, Brevard, Volusia, and Lake Counties region was 3.3 million people. If the populations of Polk, Flagler, and Sumter counties were included, the estimated population would be 3.969 million people. Explosive growth has fueled Central Florida for the past thirty years. As of 2007 there were 70,000 Asians in Central Florida according to the U.S. Census. There were almost 1,900 Japanese persons, making up 3% of the Asians. Agriculture has occupied a large portion of Central Florida's economy, with winter strawberries, citrus, timber, vegetables, and aquaculture all making major contributions. Tourism is a large contributor to Central Florida's economy. The area has economically diversified in the past decade. As a high-tech industrial hub, Metro Orlando has the seventh largest research park in the U.S., Central Florida Research Park, the engineering and business school of the University of Central Florida. It has defense companies such as Lockheed Martin and Siemens. Medical research is conducted in Orlando's Lake Nona area with the University of Central Florida medical school, the Sanford-Burnham Medical Research Institute biomedical research facility and a new Veterans Administration hospital. These facilities, along with several research support companies, have led this research cluster to be referred to as Medical City. In 2012, an estimated 400,000 veterans lived in ten of the counties of Central Florida. A $665 million Veterans Administration hospital was being built in Lake Nona. Completion was scheduled for 2013. The Tampa Bay area has become a center of high-tech manufacturing and research, while both Orlando and the Tampa Bay area are centers for the financial industry, especially insurers and back-end operations for large banking companies. Ferris Groves Store in Floral City, one of many Old Florida style citrus stands found on the back roads of Central Florida. Active military installations in Central Florida include Patrick Air Force Base and Cape Canaveral Air Force Station located on the Atlantic coast; MacDill Air Force Base, Coast Guard Air Station Clearwater and Coast Guard Sector St. Petersburg on the Gulf Coast; and Naval Support Activity Orlando, the Navy Pinecastle Impact (Bombing) Range, and the Avon Park Air Force Range located inland. These are augmented by major commands that are tenant activities at these installations, such as the headquarters for United States Central Command (USCENTCOM) and the headquarters for United States Special Operations Command (USSOCOM) at MacDill AFB, the Naval Ordnance Test Unit and Coast Guard Station Port Canaveral at Cape Canaveral AFS, and other Active, Reserve, Army National Guard, and Air National Guard activities that are located as either stand-alone facilities or as tenants on the active duty installations. Additional former facilities that have since been closed and converted to civilian use include Naval Air Station Sanford, which closed in 1968 and is the present day Orlando-Sanford International Airport; McCoy Air Force Base, which closed in 1975 and is the present day Orlando International Airport; and Orlando Air Force Base, which was transferred to the Navy in 1968 and renamed Naval Training Center Orlando until its BRAC-directed closure in 1999 and conversion to the present day Baldwin Park neighborhood. Silver Springs in Ocala is one of the many natural springs and lakes found in Central Florida. 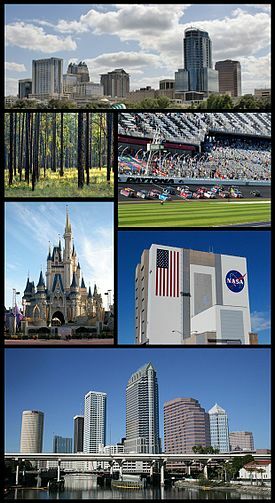 The other major U.S. Government installations in Central Florida is the Kennedy Space Center, a NASA facility located adjacent to Cape Canaveral AFS, and the Department of Veterans Affairs (VA) Outpatient Clinic at Baldwin Park (former Orlando AFB Hospital / former Naval Hospital Orlando) and the VA Hospital at Lake Nona. Central Florida has three major zoos, the Central Florida Zoo and Botanical Gardens, in Sanford, the Brevard Zoo and the Busch Gardens Tampa Bay animal park. There are also two theme parks in Orlando featuring animals: Disney's Animal Kingdom and SeaWorld Orlando. Daytona International Speedway on the day of the Daytona 500 in Central Florida. Other major attractions include Kennedy Space Center, Bok Tower Gardens, Daytona International Speedway, Fun Spot America Theme Parks, The Holy Land Experience, and Gatorland. Central Florida also has a wide variety of natural attractions including the Wekiwa Springs State Park, Blue Spring State Park, Rock Springs Run State Reserve, Canaveral National Seashore, and Merritt Island National Wildlife Refuge. The region also boasts an extensive network of recreational trails (jogging, biking, equestrian, etc.). While many connections are already in place, construction continues and will link all of the trails and greenways. Major trails include the Cady Way, Cross Seminole and West Orange Trails. Port Canaveral, located in Cape Canaveral 45 minutes east of Orlando, is a cruise, cargo, and naval port. It is one of the busiest ports in Florida and is economically tied to Orlando. Locally perceived to be Orlando's seaport, Port Canaveral is the closest port for tourists and Orlando residents alike to cruise on Disney Cruise Lines and Carnival Cruises. Future plans for the port include a rail and natural gas line running directly to Orlando International Airport. Also, another major seaport of the region is the Port of Tampa Bay, which is one of the busiest in the state and is on the verge of a huge expansion which will allow it to compete on an international level. Historic Egmont Key Light is located in Tampa Bay, built in 1848 and commissioned by Col. Robert E. Lee. The island is on the National Register of Historic Places, and is a National Wildlife Refuge and a state park. Early in the Civil War, Confederate blockade-runners used the island as a base. Not to be confused with Florida Heartland. The Dixie Highway is a historic route passing through the heart of Central Florida. Before the interstate system it connected motorists traveling between towns like Orlando, Arcadia and Bartow. A regional commuter rail network is being developed in Central Florida. The first of these initiatives, SunRail, is a commuter rail line that will run from DeLand south to Kissimmee. The first phase should be complete by 2013 with the full system in place by 2015. Amtrak also serves Central Florida running on CSX Transportation's A line and stops at the Orlando Amtrak station. The Auto Train stops in Sanford, Florida, north of downtown Orlando. A High Speed Rail line was in the planning stages at one point during the years of 2009-2011, however, that plan was eventually canceled by the Governor of Florida, Rick Scott, after a cost analysis of the project. The train line had been planned to run from the Orlando International Airport to downtown Tampa; with future lines eventually connecting to downtown Orlando, Jacksonville, and Miami. Florida's public primary and secondary schools are administered by the Florida Department of Education. ^ a b c d Lamme & Oldakowski, p. 329. ^ Lamme & Oldakowski, p. 335. ^ Charting the Course, p. 2. ^ Washington, The (January 28, 2008). "As I-4 corridor goes, so goes Florida". Washington Times. Retrieved February 17, 2012. ^ "Microsoft Word - FDOT_BD548_07_rpt.doc" (PDF). Retrieved November 4, 2012. ^ "FHP: Florida Facts". Flhsmv.gov. July 1, 2000. Archived from the original on October 3, 2011. Retrieved February 17, 2012. ^ "Average Temperatures in Florida". Current Results. Retrieved February 17, 2012. ^ "Bill's Garden". Garden.bsewall.com. Retrieved February 17, 2012. ^ "NWS Pueblo, CO - Lightning Casualty Statistics USA Page". Crh.noaa.gov. August 31, 2010. Retrieved February 17, 2012. ^ "NWS Lightning Frequency Safety Map". Lightningsafety.noaa.gov. Archived from the original on January 22, 2012. Retrieved February 17, 2012. ^ a b "East Central Florida". Visulate.com. Retrieved July 2, 2014. ^ Type Studies from the Geography of the United States by Charles Alexander McMurry, Macmillan & Company, 1908, page 81. ^ a b Lamme & Oldakowsi, p. 336. ^ Warf & Waddell, pp. 88. ^ Lamme & Oldakowsi, pp. 336–337. ^ a b Lamme & Oldakowsi, p. 337. ^ "Slideshow Failed Conversion". Slideshare.net. Retrieved February 17, 2012. ^ Persaud, Babita. "Japanese residents in Central Florida strive to keep their children's legacy alive with Japanese culture and language courses at Orlando Hoshuko school" (Archive). Orlando Sentinel. December 16, 2007. Retrieved on February 16, 2015. ^ Bureau of Economic and Business Research (2011). "Florida Population: Census Summary 2010". University of Florida. ^ "Central Florida Research Park". Cfrp.org. Retrieved February 17, 2012. ^ "Synergy city: Medical researchers head for Lake Nona - Orlando Sentinel". Articles.orlandosentinel.com. February 13, 2011. Retrieved February 17, 2012. ^ Vatner, Jonathan (September 7, 2010). "Orlando's Newest Attraction Is Lake Nona, a Medical City". Orlando (Fla): NYTimes.com. Retrieved February 17, 2012. ^ Moody, R. Norman (February 27, 2012). "Changes slow VA hospital". Florida Today. Melbourne, Florida. pp. 1B. ^ "Tampa Bay: High Tech Hotbed". ^ "Can high-speed rail backers bypass Gov. Rick Scott? - Orlando Sentinel". Articles.orlandosentinel.com. February 16, 2011. Retrieved February 17, 2012. Lamme, Ary J.; Oldakowski, Raymond K. (November 2007). "Spinning a new geography of vernacular regional identity: Florida in the twenty-first century". Southeastern Geographer. 47 (2): 320–340. doi:10.1353/sgo.2007.0029. Warf, Barney; Waddell, Cynthia (January 2002). "Florida in the 2000 presidential election: historical precedents and contemporary landscapes". Political Geography. 21 (1): 85–90. doi:10.1016/S0962-6298(01)00063-4. Anthony J. Catanese Center for Urban and Environmental Solutions at Florida Atlantic University (2006). "Charting the Course: Where is South Florida Heading?" (PDF). Florida Atlantic University. Archived from the original (PDF) on December 16, 2011. Retrieved March 30, 2012.